Kakiage is a type of tempura fritter made with mixed vegetable strips, and it’s one of the most popular topping for Japanese soba noodle soup. Cook the soba noodles in a large pot of boiling water until cooked (follow the package directions) and drain. Place the cooked soba noodles in a deep bowl, pour in the hot noodle soup, arrange the vegetable kakiage on top, garnish with chopped spring onion and sprinkle with nanami chilli pepper (optional). Lightly wipe the kombu with a clean damp cloth, Put the kombu in a large saucepan, cover with 1200ml of water and soak for 30 minutes. Set the saucepan over a medium heat. Just before the water comes to a boil, remove the kombu. Place the kombu stock, soya sauce and mirin in a pan and bring to the boil, turn down the heat to low and simmer the noodle soup about 2 minutes. Heat the oil in a deep pan to 170C/340F. Combine the flout and baking powder in a bowl. Place 150ml water and 2 ice cubes in another bowl, add the flour mixture and mix together very lightly. 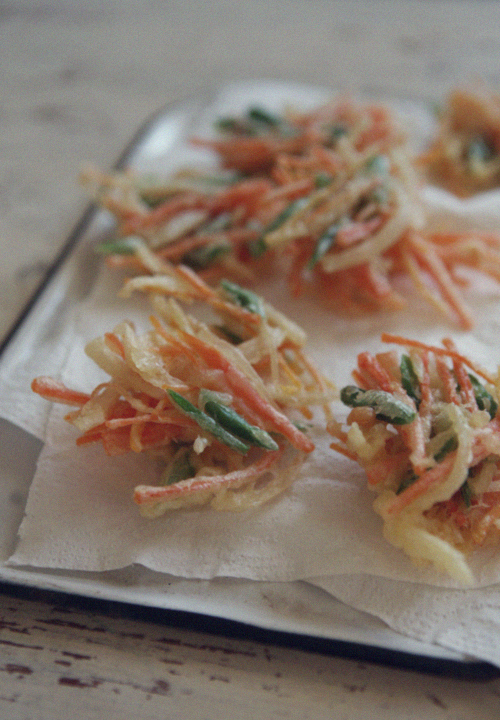 Add the carrot, onion and green beans in the batter and mix together. Take a scoop of the mixture with a large spoon and slip into the oil. Shape the piece, deep-fry until crisp and golden. Drain excess oil on kitchen paper. 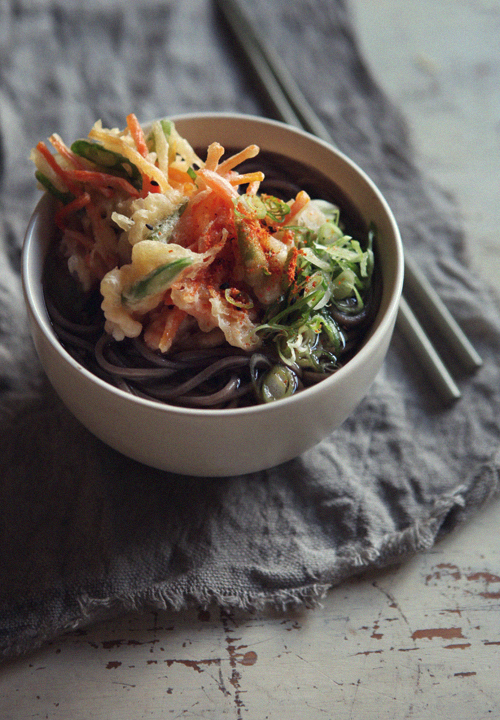 You are currently reading Vegetable Kakiage Soba Noodle Soup at Fish Trip Cafe.